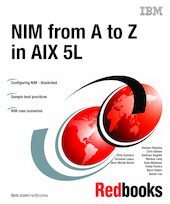 This IBM Redbooks publication will help the AIX 5L technical community, and in particular system administrators who are well versed in the concepts and terminology of the AIX Operating System, to understand the benefits of implementing a Network Installation Manager (NIM) environment in their data center. The book applies to AIX 5L V5.3 Technology Level 5, Cluster Systems Management (CSM) V1.5.1, and IBM Director V5.1. The concept of a cluster (that is, at least two IBM System p machines connected through a network) presents the challenge of installing, maintaining, updating and backing up the various participants in the cluster. NIM, a critical feature of AIX, can perform these tasks for your System p server farm. Using NIM, you can install or upgrade many IBM System p machines and LPARs with the same (or different) images at the same time. This publication complements the information found in IBM technical AIX 5L manuals, and will be most useful as a reference guide.